½ tsp. each of Salt and freshly ground Black Pepper. NOTE: It is a little difficult to be precise about the bread dough quantity and ingredients as I just used some leftover simple bread dough my wife made for pizza. She made a batch with 4 cups of flour and I used half of it to make a single pizza for supper one night. I used no more than half of what was still remaining for this recipe. 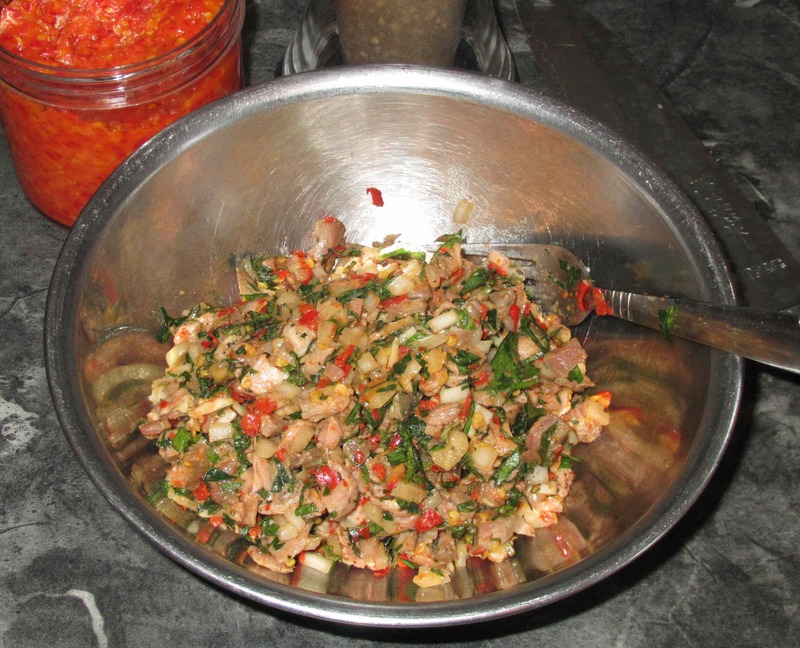 Mix the filling ingredients together in a small bowl and set aside. The mixture should be somewhat moist so that it sticks together for ease of handling. If it is a little dry, try adding a tablespoon or two of yoghurt, or else a sprinkling of flour and a little water. I found that the pureed garlic and chili paste were sufficient to give the right ‘wetness’. 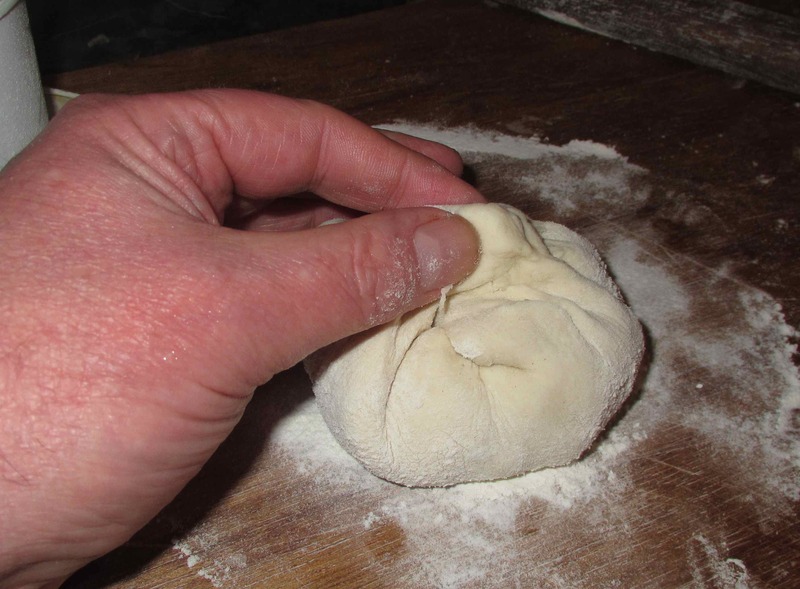 For each bun, you need a lump of dough about the size of a small egg. 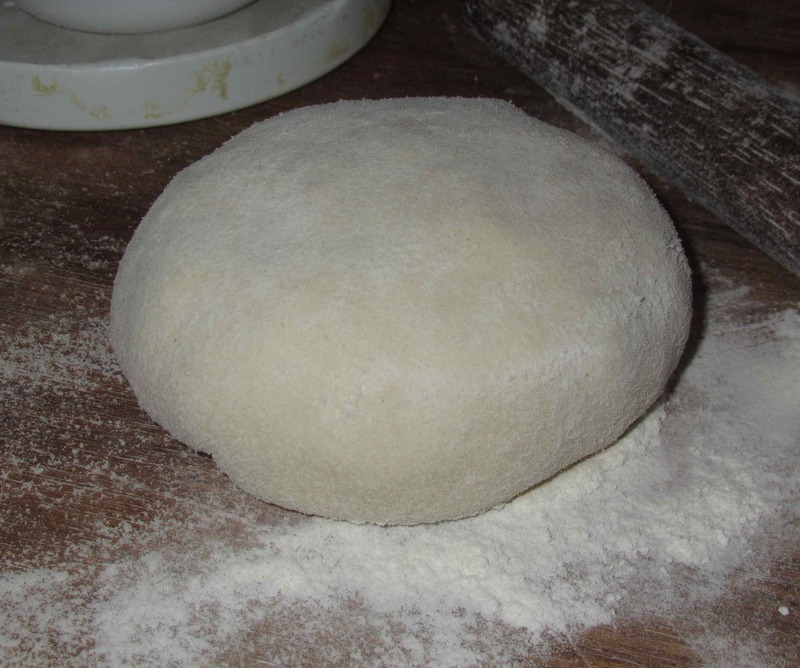 Roll it out to a rough circle about 6 inches in diameter and then place one quarter of the filling in the center. Now, gather up the edges over the top of the filling and pinch tightly to seal. 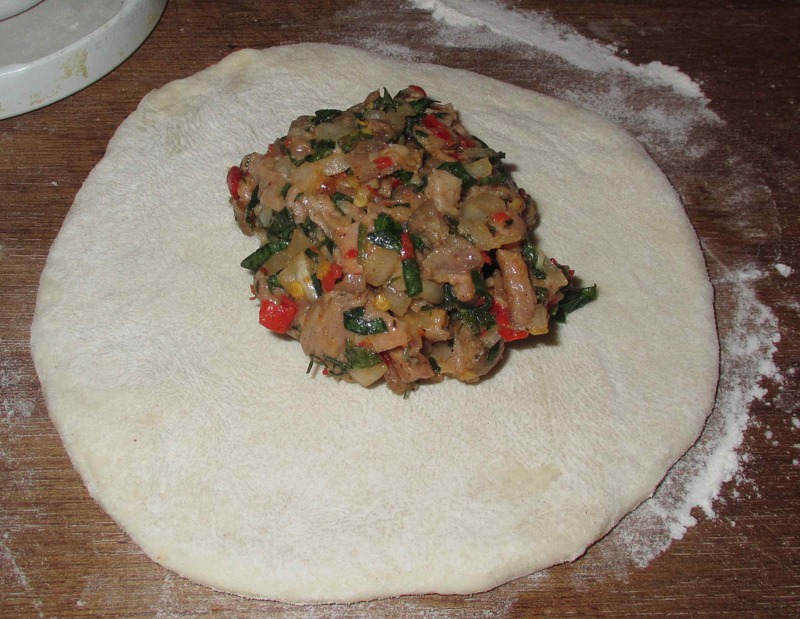 Finally, turn the bun over and smooth it into a nice round shape, then repeat with the rest of the dough and filling. 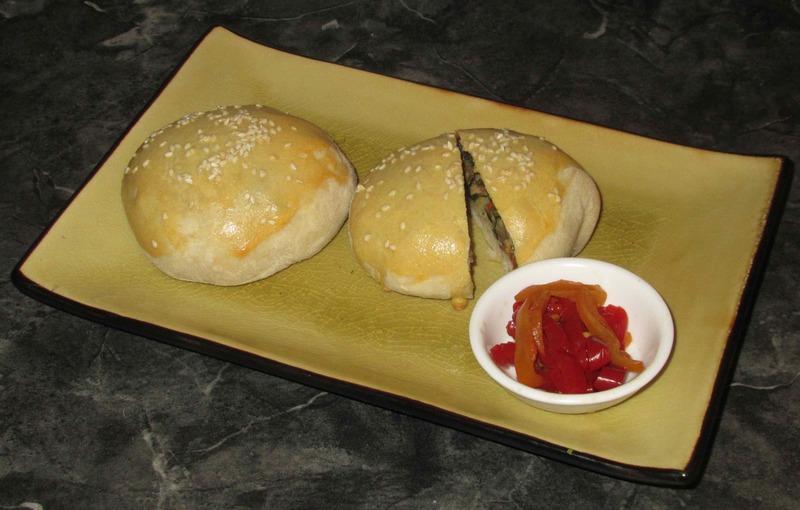 You can, of course, make smaller buns using less filling and smaller lumps of dough, if you like. Once all the buns are formed, place them on a greased, foil-lined baking sheet, making sure there is plenty of space between each one. 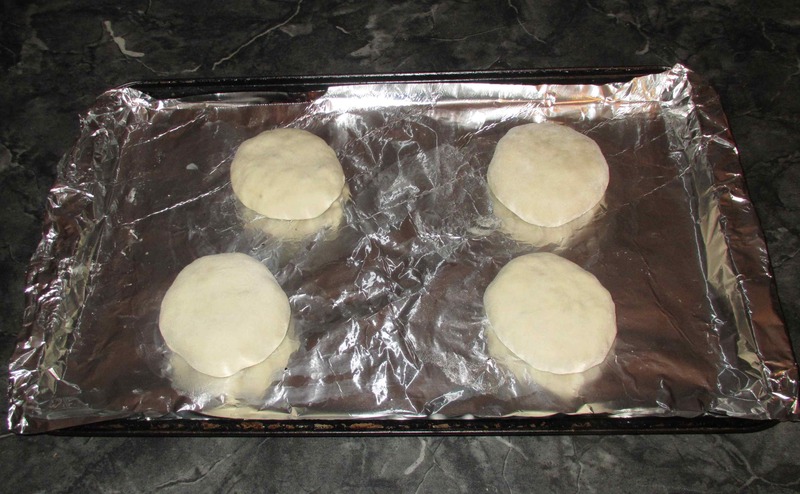 Now, leave them to rise for a good thirty minutes or so and, while this is happening, pre-heat your oven to 350 degrees. The buns need to bake for about 25 minutes. At the halfway mark, brush the tops with the beaten egg, if using, as this will give a nice glazed appearance to them once they are done. You can also, if you wish, sprinkle with sesame or poppy seed. Once done, remove from the oven and cool on a wire rack for at least five minutes before serving. They are also good cold and, in either case, some pickles, or perhaps a nice fattoush make a nice accompaniment. Very creative! What are the Chinese varieties you referred to? 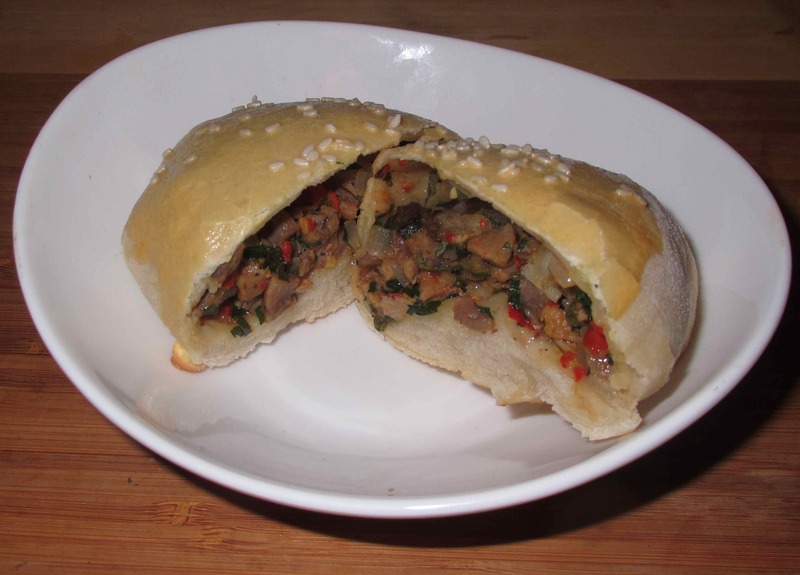 Like BBQ Pork bun? Fiery but very flavorful I’m sure. Lots of scope for improvising too! I’m a fan of the heat, but from you I’ll consider that a true warning! Thanks! Really interesting recipe! You are one of the more creative cooks on the interwebs, and I always enjoy seeing what you’re doing. Thanks for this. This was really a creative dish! I immediately thought of those little Chinese buns when I saw the picture, but the idea of lamb was quite inspired! I am sure they were delicious!